Hey everyone, my cousin from France will be in NYC this weekend, so I decided to head up there since I haven't seen her in years. 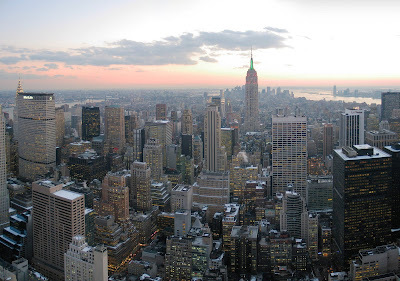 I'm so excited because I LOVE NYC. I love the buildings, the shopping, the lights, and the food, mmmmm. Last time I posted about my NYC trip was in January, so now it's time for NYC in the summer. Bethesda Chevy Chase Restaurant Week returns to offer prix fixe lunch and/or dinner menus at 31 Bethesda area restaurants. A two-course lunch is $12 or $15 and three-course dinner is $25 or $30. Restrictions may apply. Please call individual restaurants for restrictions, menu options and reservations. Hi everyone! Sometimes its nice to sleep in and then head out to get some breakfast. The bf and I decided to get some pancakes and eggs at The Original Pancake House. It happens to be my favorite breakfast joint. It's located on Rockville Pike near the Randolph Rd intersection. The parking in kind of limited, however the parking lot next to it with the Houston's has plenty, even though you're not REALLY supposed to park there. The closest metro stop would be Twinbrook on the red line. We were actually waiting outside because this whole waiting area was PACKED. It did die down when we were called over the loud speaker to be seated. This is one side of the dining room. It's a lot more cheery than some breakfast places. I like the lighting, colors and decor. This is the other side, which extends all the way down to that orange painting in the back. They have a huge assortment of pancakes here (21 kinds! ), omelettes, crepes, Belgian waffles, meats, cereals, sides, and specialities. I usually order the 'Chocolate Chip Waffle- Semi sweet chocolate drops, dusted with powdered sugar and topped with whipped cream for $7.25 (SOO GOOD), but I was in the mood for something new. I decided to order the 'Banana Pancakes- Buttermilk pancakes filled with diced bananas, dusted with powdered sugar. Served with whipped butter and syrup' for $9.50. I think it came with 6 pancakes and some citrus sauce that I didn't use. It was really good with a subtle hint of banana. The bf also ordered the 'Western omelette- A perennial favorite filled with ham, red and green peppers, and onions' for $9.75. I didn't get a chance to taste it because I was stuffed, but the bf claims it was one of the best omelettes he's ever had. Both of his dishes came with pancakes, so he had 6 that we ended up taking home. They actually microwave really well! We didn't have any of the freshly squeezed orange juice, but I thought the machine was really cool. You can get a glass of it for $2.95 and $3.75. They also offer a children's menu where nothing is over $5.35. I love this place so much because every time I come in the servers are super nice, and everything I order is delicious. It's not the cheapest place to get breakfast, but you won't be disappointed. Their signature pancake is their apple, however it can take up to 20 min to make if their busy, so I've been too hungry to wait. I think I'll give it a shot next time I'm there. Hi Everyone! OMG, it's like 2 weeks after 4th of July =) Anyway, I was at my cousin's place and we were all told to bring something for our 4th of July BBQ. I checked out another blog I enjoy called Macheesmo for some recipe ideas. Nick takes beautiful photos of the dishes he makes, which helps someone like me to understand the steps. 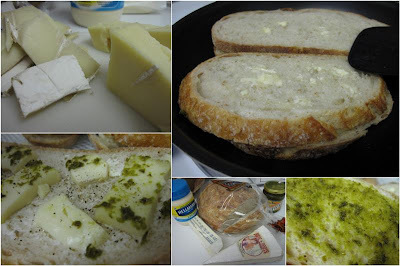 I decided to make a version of his Pesto and Brie Grilled Cheese since it would be easy to prepare and make. Cut of the cheese rind, slice the brie and place it on top of a buttered and mayo-ed slice of bread. The other slice has the pesto and pepper. Place slices together on a pan and squish until cheese is melted and bread is golden brown. It tasted really good, however I don't think I did it right. Next time I'd use a fattier Brie since it didn't really melt. I even put them on the grill in foil to help the cheese melt, but it didn't do much. I also don't think I put enough butter. 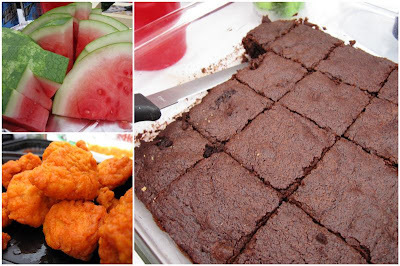 There's nothing better than the '3 F's' - Food, Fresh Air, and Friends. 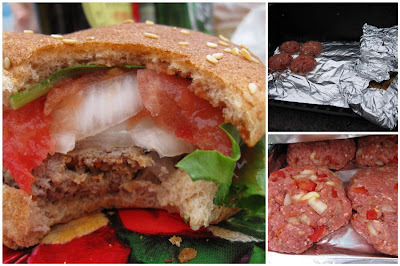 My friend hand-made the burgers, which were really moist. They had carrots in them! We also made brownie sundaes at the end of the meal. We saw fireworks at a local high school at the end of the night. Hope you guys had a good 4th of July (I know this is late)! Hi Everyone! It's been a while since I've posted. Life gets in the way sometimes, haha. Anyway, one day during my lunch hour I decided to try out Ricky's Rice Bowl in Gaithersburg and shot pics with my Iphone. The closest metro stop would be Shady Grove on the red line. It's located in Gaithersburg Square and there is plenty of free parking. There are a few tables outside so you can enjoy the nice weather while you eat. It's your regular, casual lunch spot where you order up front, get a number, wait 5 minutes then pick up your food when your number is called. The decor isn't anything special but there are a lot of tables. All utensils, sauces and napkins are located in an island in the middle of the dining room. The main part of the menu consists of 18 different bowls of rice with different meats (chicken, steak, fish) and sauces (teriyaki, Seoul, peanut, curry, sesame garlic). You can order one of two sizes, and substitute for brown rice for a small fee, if you'd prefer. I ordered the regular size bowl of '#5: Curry Chicken Bowl- Mild Japanese curry sauce, grilled chicken, rice and veggies' for $5.95. There was a lot of food in the bowl. I actually didn't finish it! So it's a good price since you get a lot of chicken and rice. The taste was a bit bland compared to the Japanese curry I've had a few times in the past. I would've preferred more sauce too, but that's also an extra 50 cents. It is a place geared towards a quick lunch, so I shouldn't have expected it to be the best rice bowl. Maybe their Chicken Teriyaki is better since I'm sure it's the most popular and is listed 1st on the menu. Hi Everyone! Last week I had the pleasure of attending a media preview for a new restaurant called Pandini's. Its grand opening will be on Thursday, July 9th at 11am in Germantown. The closest metro stop would be Shady Grove on the Red Line. It is located in a shopping center off of Middlebrook Rd, so there is plenty of free parking. I love it when a restaurant has outdoor seating. 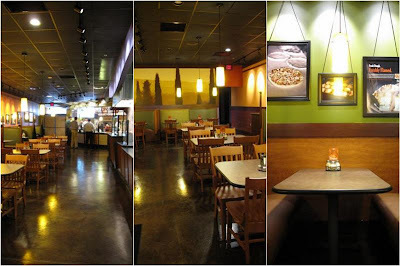 The interior has a 'Panera' kind of feel, but much nicer. There are booths lining one side of the place and tables in the center. What's cool about this place is that all of the preparation and cooking is done out in the open. 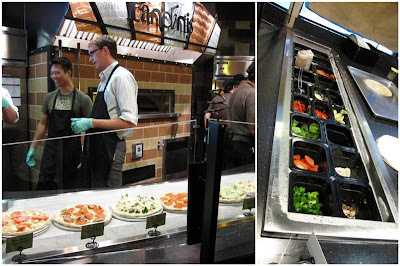 There are stations for pizza, Labretti (their warm sandwiches), salads, and pastas. The pizza station is the first one that you see when you walk through the door. They have a hot stone oven that cooks their 10" round pizzas in 4-6 minutes. There are 9 different pizza options that range between $5.99-7.99. There are some vegetarian options too. Their signature items are the Buffalo Chicken, Barbecue Chicken and Thai Peanut Chicken pizzas. All of their dough is hand-stretched daily. 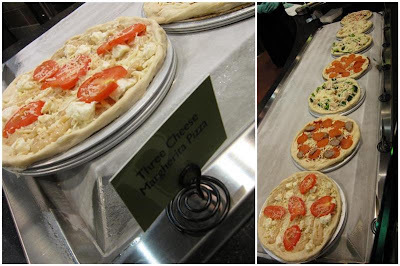 Note: These pics above are of uncooked pizzas. They're assembled before ordering, then plopped in the oven when you order so that they're still fresh and hot. Pandini's signature sandwiches are called Labretti's. 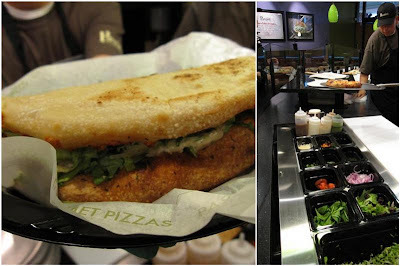 It is a folded pizza shell filled with different ingredients to create a sandwich. Some flavors include Chicken Caesar, Pesto Chicken and Handmade Meatball. They range in price between $5.99-6.99. The next station is for Chopped Salads. 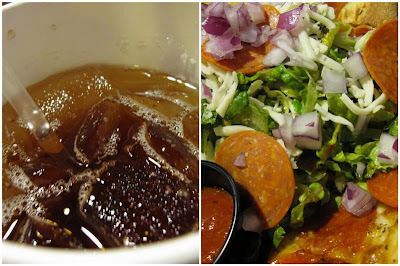 They offer 7 different types of salad, including their signature Pizza salad, and best-selling Chef's Salad. They're all served with Focaccia bread and range in price from $3.29-7.89. Next to the salad station is their Pasta station. 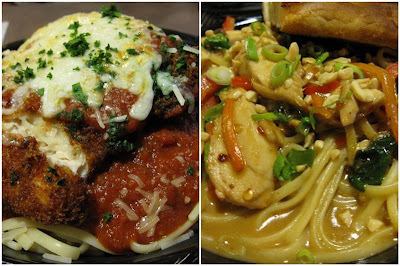 7 different types of pasta including their signature Thai Peanut Chicken and Chicken Parmesan. Their prices range from $6.99-7.99. Whole wheat pasta is available if you prefer being healthier. 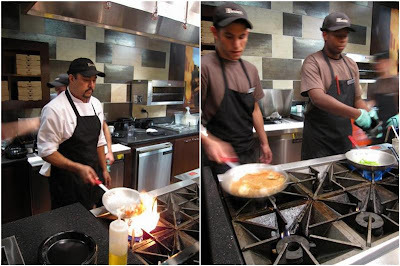 It's really cool to see them make the pastas because of the occasional flame from the burners. The guy in the white on the left is the head chef Robert D'Orsi, how cool! Lastly is the register. 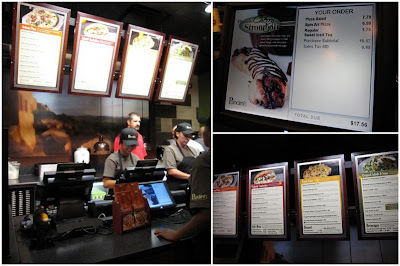 All of the other stations are to help you decide what to order when you're actually at the register. They have a screen that's facing you to display what you're ordering and how much the total will be. If you've noticed, nothing on the menu is more than $7.99! They offer fountain beverages, freshly brewed teas (sweet tea and unsweetened), coffees and a small selection of beer and wines. This little contraption is very cool. After ordering, you are given an order number. 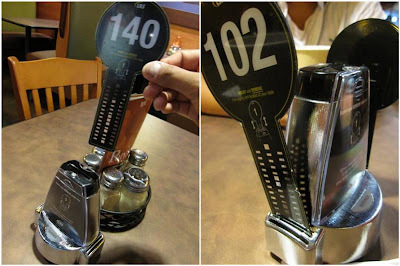 Pick a table, stick the number into the device on the table, take it out and place the number in the holder on the side. The device tells the runners in the back which table you're sitting at. Once you stick the number into the device, your food should be brought to you in less than 7 minutes, otherwise the manager's pager will go off. You can even change tables, re-stick your order number and the timer won't be reset. Pretty awesome stuff. I did get a chance to check out the back kitchen, and it's TINY. Some things like pounding and breading of the parmesean chicken are done in the back, but really eveything is done in full view of the restaurant. Ok onto the food! The bf and I ordered sweet tea, which was really good. Nice tea flavor instead of it just tasting like sugar water. I'll prob get it everytime I'm there since you don't see it offered very often. Next we tried their 'Pizza Salad- Romaine lettuce, shredded mozzarella, pepperoni and red onions, with our vinaigrette marinara dressing. Served with our pepperoni bread' for $7.89. It was a strange concept having a pizza flavored salad. I loved the pepperoni bread, however the salad itself with the marinara dressing wasn't the best thing they had to offer, in my opinion. I don't think I'd order it again. 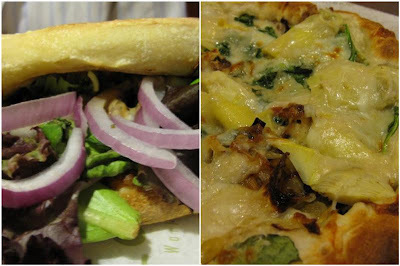 The bf ordered the a Labretti sandwich - 'Peppercorn Steak- Roasted Philly steak and market fresh greens with mushrooms, red onions, shredded mozzarella, and a creamy peppercorn sauce' for $6.99. He loved it! I didn't get a chance to take a bite but I know he'd recommend it. He said all of the vegetables tasted really fresh. I ordered a pizza - 'Spinach and Artichoke- Garlic infused spinach and artichoke, caramelized onions, melted mozzarella, parmesan and a velvety Alfredo sauce' for $6.99. It was so good! I'm a huge fan of artichoke, and they don't skimp on the toppings. We were brought out two pastas to try. The 'Chicken Parmesan- Parmesan breaded chicken over linguine pasta in tomato sauce, finished with grated Parmesan, shredded mozzarella and fresh parsley' for $7.99. It was really good, big portion, nice portion of chicken and al dente pasta. The 'Thai Peanut Chicken- Roasted chicken, linguine, red peppers, onions, carrots, mushrooms and spinach, tossed in our spicy Thai peanut sauce. Garnished with peanuts and scallions' for $7.29. This dish was interesting because our first bites had an overwhelming flavor of peanut butter, but the more you eat it, the better it tastes. Then the different levels of flavor come out like spiciness and coconut milk. It's actually really good if you're into fusion dishes. Overall, I'm very pleased and excited about this place. It's very affordable, and the quality of the food is amazing. Of course I'm not going to love everything (Pizza Salad) but the freshness, quality, speed and price really get me. It's a casual place where kids can come eat (they have their own menu, items $3.99), or a cute place to take your significant other and get pasta with a glass of wine before a movie. They also offer their diners free Wifi. The 1st 100 people in the door at the grand opening this Thursday July 9th will receive a 'Free Meal once a month for a Year', so see ya there!! For Father's Day, my family met up at my aunt's house for a BBQ. It was a perfect day to eat outside on the deck with loved ones. Everyone was asked to bring something, and I was assigned to make dessert. I found this recipe off a blog I enjoy reading called The Bitten Word. Zach and Clay share their cooking and baking adventures by using recipes from their collection of food magazines. I figured everyone loves chocolate and dads love beer, so a Chocolate Stout cake would be perfect! Listed below is the full recipe, but I cut it in half since I read all of the reviews and The Bitten Word's post, and it was just going to be too much cake if I followed the original recipe. I love eating with my family. We always have really good food, and its relaxing to hang out with one another since daily life can be so hectic. We had guacamole, roast beef, broccoli and cauliflower with cheese, deviled eggs, Greek salad, kim bap, and and Irish cheese. Hope all the dads out there had a good day of pampering and being well-fed! 4th of July is this weekend, and I'll be making something new for that BBQ, so I'll definitely post that soon.